I will be away visiting my daughter and her family for most of this week. She and her husband are expecting another baby at the end of September, so this is a very exciting time for all of us. 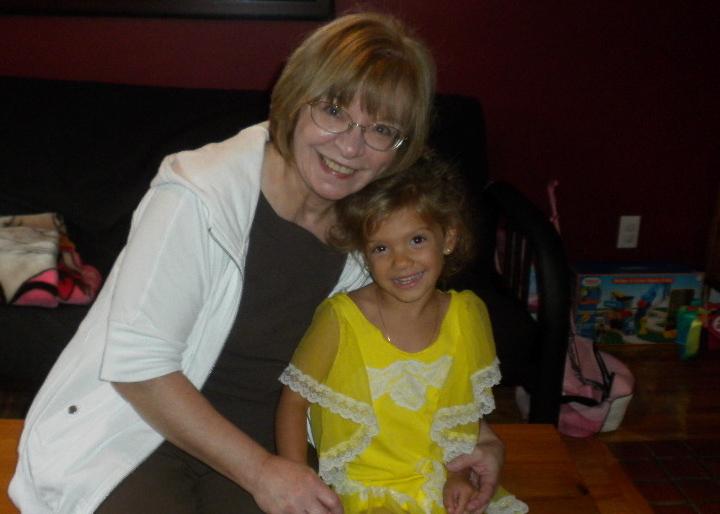 The picture in this blog topic was a quick photo from our last visit and that beautiful little angel beside me is my granddaughter, Kyra. So, I am leaving it to my readers – once again – to add interesting articles and links and videos from events that will occur over the next few days. And, I am sure I have missed many events in the last few days, so please add your comments about these as well. I am excited to view the new The Jay Leno Show tomorrow night. His first guest is Jerry Seinfeld, with musical guest Jay Z and Kanye West. So, he is off to an excellent start! I will check back every so often over the next few days and join the chatter party. Fire away, readers! Heading out the door, but had to watch this! David’s performance was beyond gorgeous. Sheer brilliance, as always! I had goosebumps. Thank you Sheryl for adding this link! Keep them coming! Hey there MCL, nice to see you back and congratulations! I’m with Sheryl, David’s rendition of America The Beautiful was AWESOME and OUTSTANDING! Watching and hearing David sing last night is something to remember, I can’t say enough good things about that young guy! Roseanne, I am so happy for you, your daughter, and family! I remember when you first announced the upcoming birth of your Grandbaby. May your daughter have an easy delivery. There’s nothing like a newborn baby to make life just a little bit brighter! Take care and God bless. I hope to hear David’s song when I am at my daughter’s later this week. I am so happy that both Davids are doing so well! I agree David Cook opened up more doors; however, he did say that Bo Bice opened up doors so he could be a contestant on Idol. I was watching reruns of Season 4 (one of my favorites) and Bo was definitely a rocker. Just awesome, as is David and Adam! Thanks so much, Kariann. And have a wonderful time at your daughter’s as well. A change is indeed better than a rest. David Archuleta always sings anazingly. Great job. I wasn’t sure where to post this, so I figured here would be okay. I was fortunate to see the Idols in Syracuse this past Monday. I thought all of them sounded really good. I was particularly impressed with Lil, Anoop, and Matt. Their voices sounded quite strong, and they performed well. Of course, the top 4 were awesome as usual. My brother took some vids of the Idols performances in Syracuse. HQ version of David Archuleta singing “Contigo En La Distancia” at the Alma Awards. Beautiful, soulful, emotional, and amazing! MCL have tissues nearby. MCL Can’t wait for your review of David’s Alma performance. It was stunning. Also would like your review of Desparate. Hope you had a nice visit with your family. MCL, have you seen David Archuleta’s performance at the ALMA awards on 18 Sept.? Stellar! See the link below. Adam and Kris performed at Ford Day yesterday. The songs were all acoustic, and they both sounded amazing. It was fun hearing Adam and Kris sing Crazy, as Adam has sung that song various times at Upright Cabaret. I loved the duet and thought they enjoyed it as well. Beth, I wish I could have met you there! Look at your YouTube videos. Uh, well I can’t look at them because I have Dial-Up service, but I can see the picture. I hope to get to my daughter’s on Monday to see them. Look how close. Were they more relaxed? I just imagine that they would be. Roseanne, I hope all is well! Are you referring to the acoustic performances for the Ford Day? Or the Syracuse concert? The Idols were definitely more relaxed in Syracuse and were more comfortable than on opening night! Wanted to second to give you credit, yes please continue with your postings, i really enjoy them. You constantly can write something entertaining that won’t leave you with an empty feeling like what you see on countless other blogs.